CCRT under the Ministry of Culture invites on-line applications from Indian nationals for the Award of Scholarships to Young Artistes in Different Cultural Fields for the year 2018-19. This Scheme seeks to give assistance to young artistes of outstanding promise for advanced training within India in the field of Indian Classical Music, Indian Classical Dance, Theatre, Mime, Visual art, Folk, Traditional and Indigenous Arts and Light Classical Music. ** Bharatnatyam, Kathak, Kuchipudi, Kathakali, Mohiniattam, Odissi Dance/ Music, Manipuri Dance/ Music, Thangta, Gaudiya Nritya, Chhau Dance/ Music, Sattriya dance. ** Any specialized aspect of theatre art, including acting, direction, etc., but excluding play writing and research. ** Graphics, Sculpture, Painting, Creative Photography, Pottery & Ceramics, etc. ii. Light Classical music based on Carnatic Style, etc. iii. Rabindra Sangeet, Nazrul Geeti, Atulprasad. ** Candidates should be Indian Nationals. ** Candidates should have an adequate general education to pursue their training effectively. Candidates must give evidence of their desire to make the pursuit of their training effectively. ** As the scholarships are meant for advanced training and not for beginners, candidates must have already acquired a degree of proficiency in the chosen field. ** The candidate should have undergone a minimum of 5 years training with their Guru/Institutes. The Certificate to this effect in Part II of the Proforma duly signed by the present Guru / Institute and former Guru/ Institute (if any) should be submitted along with the application. ** Candidates should have an adequate knowledge in the connected arts/ disciplines. ** The candidate’s age should not be less than 18 years and not more than 25 years as on 1st April of the year in which the application is being made. Age relaxation is not permissible. Applications will be accepted online only. Just follow the below steps to apply for the Scholarships for Young Artistes in Different Cultural Fields 2018-19. 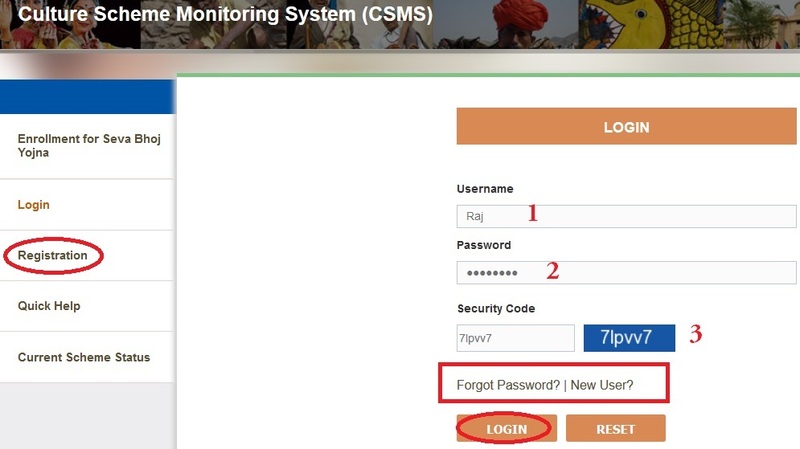 Step 3 : It will redirect to the Culture Scheme Monitoring System and Click on Registration link. Step 4 : Fill up the Registration Form with the required details. Step 5 : Get Username and Password for Login. Step 6 : Go to current scheme status. Step 7 : Click on the appropriate Scheme “Apply Online” link. Step 8 : Fill up the the remaining details to complete the application and finally submit your application. ** One self-attested copy of Education Qualifications (Degrees, Diplomas etc. ), experiences etc. In no case the original documents are to be attached. ** One self-attested copy of the Matriculation or equivalent certificate or other admissible evidence of age. (Other than Horoscope). ** One Passport size recent photograph. ** In the case of candidates applying for scholarship in the field of Painting, Sculpture and Applied Arts, they are required to come with self-attested copies of photograph of the Original works. The minimum qualification for Visual Arts is BFA or equivalent. ** Separate on line application should be submitted for each field, if the candidate wants to apply for more than one field. ** As the scholarships are awarded for advanced training, the candidates should have undergone a minimum of 5 years training with their Gurus/Institutes. The certificates to this effect duly signed by the present Guru/ Institute and former Guru/ Institute (if any) should be submitted along with the application. 400 Scholarships for financial year (2018-2019) will be awarded. Each selected scholar will be paid @ Rs. 5000/- per month for a period of two years to cover his/ her living expenses on traveling, books, art material or other equipment and tuition or training charges, if any. 1. In case of any technical difficulties in submission of application on-line please contact NIC Cell, M/o Culture through mail at nic-culture [AT] nic.in or on phone no. 011-23388601 (during week days only) .